Creating web forms to accept user input can be a bit of challenge if you are new to the scence, but fortunately there are already free open source and platform independent solutions to help you with these tasks. The widely used ones are such as FCKeditor, TinyMCE, Markdown, WYMeditor and Whizzywig. FCKEditor brings to the web much of the power of desktop editors like MS Word. It’s lightweight and doesn’t require any kind of installation on the client computer. Markdown is a text-to-HTML formatting syntax for web writers, implemented as a plug-in for Movable Type, Blosxom, and BBEdit. Markdown allows you to write using an easy-to-read, easy-to-write plain text format, then convert it to structurally valid XHTML (or HTML). Whizzywig is easy. 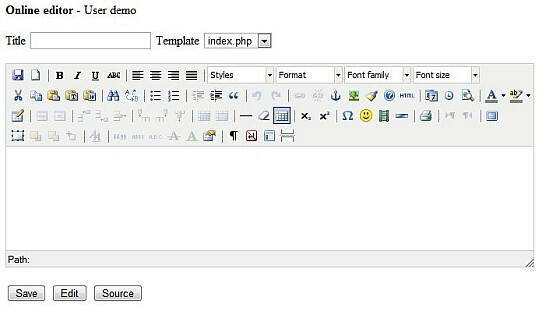 It lets people create rich, formatted text through a web form. It actually creates HTML (or xhtml, if you prefer) but you need no HTML knowledge to use it. If you can use a word processor or email, then you can use this. Please leave a comment on which ones you have personally used or any other alternatives apart from the ones mentioned above. Thanks Glen, looks like a pretty neat alternative. For the record, the editor is known as openWYSIWYG.